Voidsuits are one of the most essential parts of any stellar adventurer's wardrobe, offering solace from the many environmental hazards found on unexplored worlds. They protect their wearer from intense pressures, extreme temperatures, dangerous energy sources, toxic atmospheres, and hazardous liquids among other things, making them useful not only in the vacuum of space but also deep underwater or on a hostile planet. Sunspears or sunblades are traditional Aqylan polearms which mount an intense source of energy, such as a cutting torch or heat ray, between one to four sharp adamantine blades on the tip of the weapon. They were originally wielded by the elite Ansar warriors of Astrid Iovan's empire nearly 1,700 years ago, used to pierce through heavily armoured infantry and vehicles in melee when other portable anti-tank weapons failed to have an effect. Modern versions are tremendously advanced, often fitted with particle beams or plasma guns which make them effective at much longer ranges than the more traditional designs. Sunspears have become fairly common today, if still somewhat specialized, most famously used as the primary weapon of the Aegis of Valora and in a smaller form by some Mantle units. The Republic Navy may not have an entire branch dedicated to fielding elite troops like the army's Special Forces Division, but they do maintain quite a few of their own commandos for when basic marines won't cut it. From heavily armed Marine Raiders and jump troopers to more covert Force Reconnaissance teams and paramarines, there's no shortage of options to get a job done right. Captain Lyara Idros, also known as the Hero of New Cov or just "that lady from the marine pinups", is a Mirialan from Dantooine serving in the Republic Navy's elite 251st Special Reconnaissance Regiment. Her second in command is Lieutenant Arshia Thali, a Corellian corpsman famed for earning first class Bloodstripes at just 17 years old during the Battle of Corellia. "He was delayed by Margonites, you say? I'm sorry, but it is a proven fact that they are a myth! Nice try." Though Abaddon is long dead, replaced by the new goddess of truth Kormir over 250 years ago, a small few of his ancient demonic followers live on scattered across the deserts of Elona and elsewhere in Tyria. Some have attempted to atone for their sins by sharing their knowledge with groups such as the Durmand Priory or Order of Whispers. Others continue to obsessively collect knowledge and artifacts as they did before, scheming to gain power or defile the legacy of those heroes who defeated their lord. It takes great power to weave flesh and bone. Any alchemist worthy of their title can create crude bestial abominations, but it takes a true master of sorcery to enhance sentient beings into superior forms. Alchemical modification can be immensely painful and often leaves victims marked with horns, scars, or bony ridges as side effects, however the price is well worth it to become so much stronger. Cybernetic enhancements are considered to be a crime against nature in the Dominion, the use of which is punishable by death. External prosthetics are a different matter, however, as they do not defile the human form internally and may be used to easily restore warriors back to combat-ready status after losing a chunk of flesh too large to regrow. Modern artificial limbs are highly responsive and can move just like a normal arm or leg, generally being tailored to match the wearer's former limb in size and weight, with more advanced models even feeding sensory information back into the body. They are attached through the use of a strong vacuum pump or a miniature gravity generator in the socket, ensuring that they can support the user's weight during strenuous activities such as one-handed pull-ups without causing discomfort. In the world of information gathering and covert military operations, there's no such thing as a fair fight. False flags, undercover operators, concealed gadgets, perfidy, black propaganda, bribes, and torture are all simply basic tools in the arsenal of Republic and Imperial intelligence services. I was inspired by Space Pirates and Zombies to try drawing some warships from the top down, since I really struggle at doing 3d vehicles without any references. :/ It worked okay this time, maybe eventually i'll try to invent some new SWTOR ships this way to fill out the factons' fleets lol. Stellar vessels in the Dominion are elegant works of art plated in glistening plasteel and gold, with thick adamantine beneath and powerful energy shields on top to provide maximum protection. The Mantle's naval doctrine emphasizes speed and firepower, as such they generally rely much more on energy shielding than solid armour to save weight. The Resplendent-Class Battleship is a 507 meter wide leviathan, designed by the very best shipwrights to supplement the Mantle's century-old Majestic-Class Battlecruisers. Resplendents are built with a relatively uncommon wing-shaped design which allows them to focus all of their firepower forwards at one target, with the added bonus of providing more room for engines and allowing exceptional manoeuvrability. 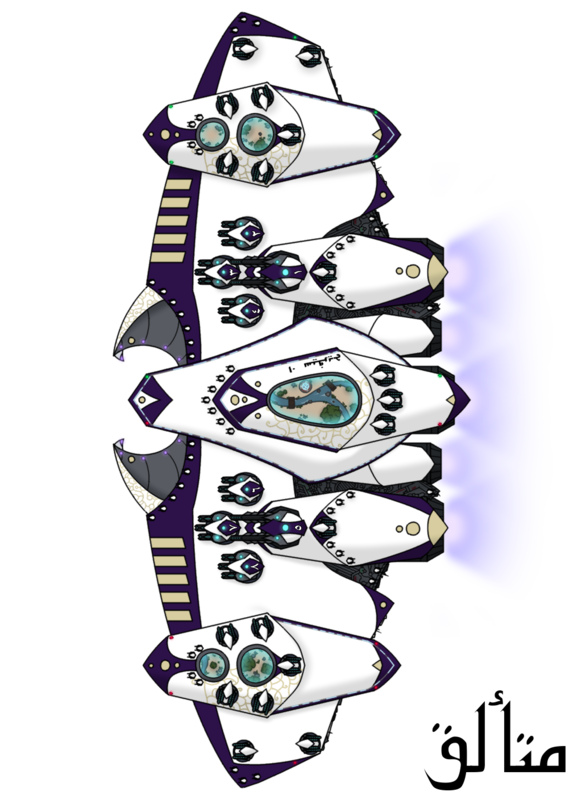 Resplendents are armed with a vast array of firepower to pulverize even the largest of enemy line ships. 2 void prisms, 2 dual-mounted accelerator guns, 6 triple ion cannon batteries, 19 quad heavy beam cannon turrets, and a smattering of point-defense burst cannons make it one hell of a gunship, melting opposing capital ships in mere minutes if they get too close. It also contains two small rear-facing hangars and an assault transport docking bay beneath, primarily to allow its resident troops to land on the surface of a planet. It has a massive crew of around 3200, with further capacity to carry a full Army Legion of 2000 troops and their equipment. Of its crew, 500 are marine infantry dedicated to defending against (and performing) boarding actions, 300 are ground and air crew who maintain the ship's small complement of strike craft, 600 are servants/slaves, and the remaining 1800 are rank and file enlisted personnel or officers who keep the ship running and shooting. 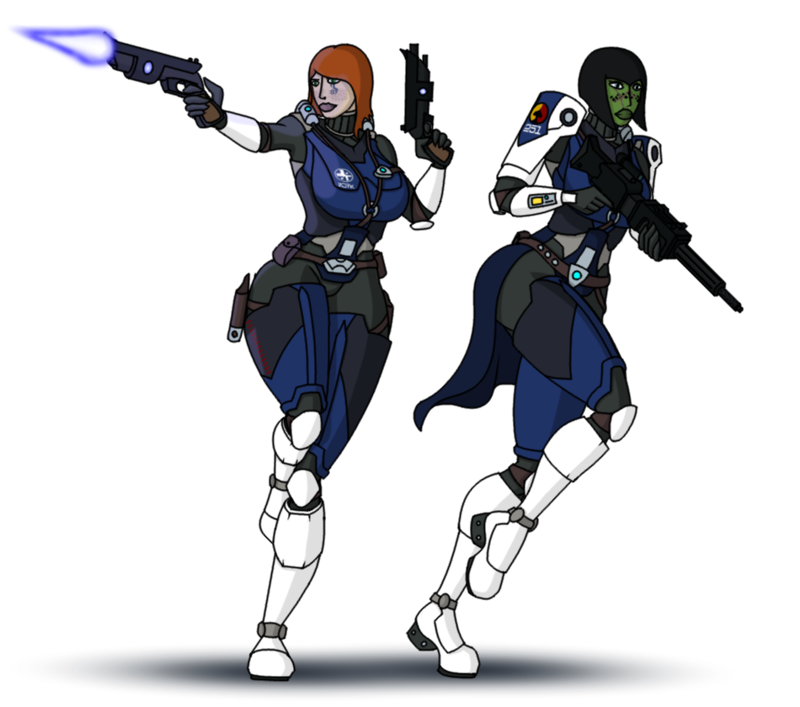 Raider Squad is an elite assault team in the Republic Army led by Captain Auri Suvas. 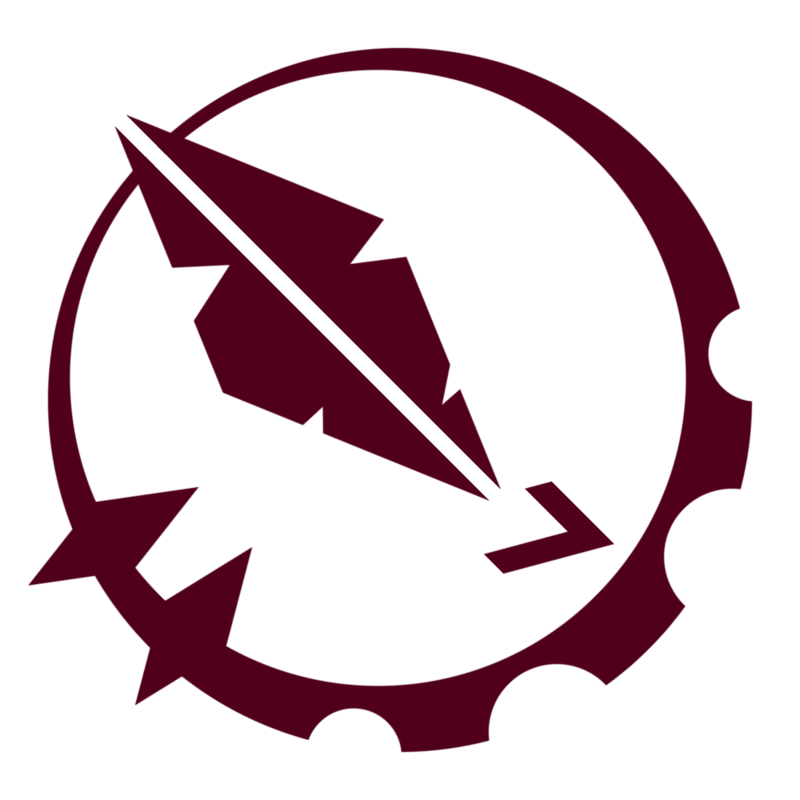 Originally part of the 13th Airborne Regiment during the Great War, they were reorganized after the Treaty of Coruscant into a separate platoon-sized unit under Elin Garza's newly founded Special Forces Division. Their larger than usual size for a special forces team allows them to be in multiple locations at once on a battlefield while still remaining coordinated under one leader, with two BT-7 Thunderclaps to allow for separate insertions or airborne assaults. Happy valentines' day! I drew the Brimstone Elemental from Terraria's Calamity mod for my gf, going to write a cute fire-related message on it after using all our ink to print it on a card lol. Too burned out to do much art lately. :/ But I did a starfighter this week tho and it looks like a birb, I think I want to do my SWTOR characters' ships too but i'm still feeling very unmotivated lol. The Type-122 Ruba'i (meaning quatrain) is a stealthy single-seat light strike fighter which serves as the backbone of Mantle aviation. Equipped with 4 rapidly firing Type-93 light storm cannons, internal weapon racks with room for up to 6 250mm bombs, a powerful shield generator, intensive radiation and magical hardening, and a silver cerement adaptive camouflage system, it is more than capable of holding its own against almost any similarly sized vessel and providing quick support to ground troops. Like most other strike craft in the Dominion, the Ruba'i uses a compact flying wing design to provide maximum manoeuvrability. Its variable-sweep wings are primarily meant to save space when stored in a naval carrier, but they also serve to improve performance in supersonic atmospheric flight. Uniquely for such a small vessel, it has no glass or sapphire canopy, instead the pilot is seated deep in the middle of the craft beneath a well-armoured hull and using an extremely advanced HUD to provide visual information. This particular craft is a Type-122 Nam.3 flown by the famed ace pilot Munaa al-Haqai, champion of the Twin Suns Armada and commander of Demonsoul Wing. Its namesake is the Scorpion Queen, a prominent figure in pre-Caliphate Aqylan mythology known for her vicious and precise combat skills. Such elaborate nose art and paint schemes are very common on the planes of veteran pilots.